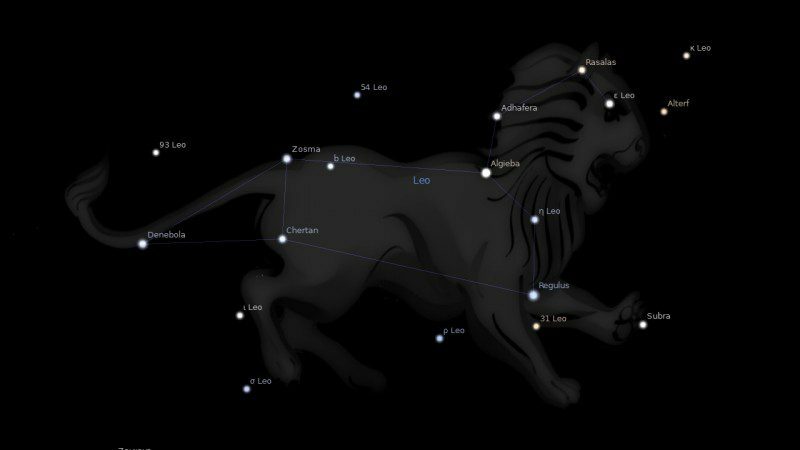 Fixed star Denebola, Beta Leonis, is a blue star in the tail of the Lion, Leo constellation. The name Denebola comes from the Arabic Deneb Alased, meaning Tail of the Lion. Denebola makes up part of an asterism called the Spring Triangle, shown in an image below. The Spring triangle is a large asterism visible in the northern hemisphere is spring. Besides Denebola, the other two fixed stars are Spica and Arcturus. Ptolemy gave Denebola a Saturn-Venus quality, which must make it at least mildly benefic even in traditional astrology, since Venus was held to be the only planet that could really get along with Saturn. The tails of the celestial creatures are at least as important as their heads, being in some cases their weaponry (Scorpio), in others their means of communication (Cetus, the Whale), in others their link to the past and of course, sometimes ‘the part we don’t talk about’! The Lion’s tail has the quality of being farthest from the end that one should not approach unwarily, and so it has a venusian quality of peace and safety about it, but we should still not be tempted into ‘pulling the lion’s tail’, as vernacular saying has wisely warned. Therein lies the Saturn quality of Denebola. We should expect, therefore, that this star symbolizes strength from the Lion, along with both the ability and the need to use it wisely and constructively. There should also be the note of looking forward while at the same time being able to draw upon past experience, gained at the head end of the animal, so to say, since this Lion faces back down the Zodiac. Uranus conjunct Denebola: Subject to fits, idiotic, insane, and sometimes violent, sharp and cunning, may commit murder during insanity. Pierre Laval 0°20′, Pamela Anderson Lee 0°23′, David Cameron 0°28′, Nicole Kidman 0°38′, Martin Bryant 0°40′, John Maynard Keynes 0°45′, Bill Shorten 0°45′, John Wayne Bobbitt 0°47′, Benito Mussolini 0°52′, Christopher Pyne 1°27′, Julio Bocca 1°30′, Heidi Fleiss 1°31′, Coco Chanel 2°00′, Franklin D. Roosevelt 2°04′, Gordon Ramsay 2°04′, Kurt Cobain 2°05′, James Joyce 2°08′. 1. Fixed Stars and Constellations in Astrology, Vivian E. Robson, 1923, p.160. 2. Fixed Stars and Their Interpretation, Elsbeth Ebertin, 1928, p.70. 3. The Living Stars, Dr. Eric Morse, 1988, p.57. 4. Fixed Stars and Judicial Astrology, George Noonan, 1990, p.43. 5. The Fixed Star Health and Behavior Imbalance, Ted George and Barbara Parker, 1985, p.67. Can you tell me what it means when it’s conjunct Pluto? I couldn’t see it at the bottom of the list. Many thanks and much appreciation for all your hard work. Hi Katie. Pluto wasn’t discovered when Robson did his interpretations. My best guess is that the disappointment and sadness of being taken advantage of in relationships would be more intense, but then lead to a positive transformation eventually. Thank you so much I have Pluto @ 20 25 sitting in my 4th house. The energy yesterday was very intense for me and there are big changes going on in the home front as Uranus also occupies the 4th. I’m still feeling it today. As to your comment on relationships, this does resonate with me. Many thanks again. What’s the best advice for me who has Ascendant conjunct Denebola to minimize the negative impacts? Hi Donny, hard to say really. I think the negatives of the fixed stars are minimized as you continue to spiritually grow. I have seen this star work really well with some but then quite nasty with others, depending on associated aspects. For example, a square to Saturn from this star would be a lot more challenging than a trine to Jupiter. Do you have any aspects to your AC/DC? HI Jamie, it trines exalted moon in Taurus, inconjunct Mars and Saturn. That’s very helpful then with the trine to the Moon being much stronger than the minor aspect to the less personal planets. Much friendlier influence on relationships too. Thanks Jamie, the thing is that my exalted moon is directly sitting on where another fixed star Algol is, and my moon is on 9th house cusp. I’ve read about your other post on Algol and it seems like that I need to explore into the depths of the darker side of human psyche. Am I correct to say that? Hi Lisa, I would combine the interpretations for Sun and Moon. This is a very interesting article about Denebola, one of the most detailed information I ever read on the web. It sounds like a lot of despair and losses associates with this fixed star. If a person is to have a Sun and Mercury conjuncting Denebola in the 5th house of Virgo with an opposition of Jupiter Retrograde in the 11th house of Pisces. Would you say this person is destined to have many losses in the areas of friendships, possibly children and most likely susceptible to public disgrace in any form of creative expressions? Also, do you know any well known celebrities or significant public figures with this fixed star in their chart that I could research on? Your thoughts would greatly be appreciated it. Thank you! I don’t use Houses or Signs for interpretation, only aspects and fixed stars. Remember the disgrace from Denebola usually comes from women so I think you should avoid gossip or boasting around women and you should be OK.
glad you mentioned women in another reply. Thanks to that virgo stelluim this star is conjunct both my sun and jupiter, and i keep thinking how any,trouble I have in life always seemed to have a female (almost never a male) behind it. Thankfully some other stars conjunct the planets so there is good things to tone this one’s effects down. Hi Lena, your experience is supported by nearly everyone I have known with this star prominent. My mother has Saturn 21:25 Virgo & 2nd husband Saturn 21:55 Virgo. Both complain constantly. Mother has Venus Square Saturn – she never had a good word for anyone nor did anyone have a good word for her. Thanks for the feedback Marcy, as sad as it is. I have my Part of Fortune conjunct Denebola. What does it signify? Hi Rex, As the part of Fortune is calculated using Ascendant, Sun and Moon, I would combine the influence of all three to get rishes, honor and wealth. Holding onto all those would depend on aspects to your Part of Fortune. Many thanks for your valuable comments. Each person does have a mission in life to fulfill and fixed stars enable us to know more in detail about our mission in life. In that sense, fixed star astrology is preferable to zodiacal astrology based on twelve signs. 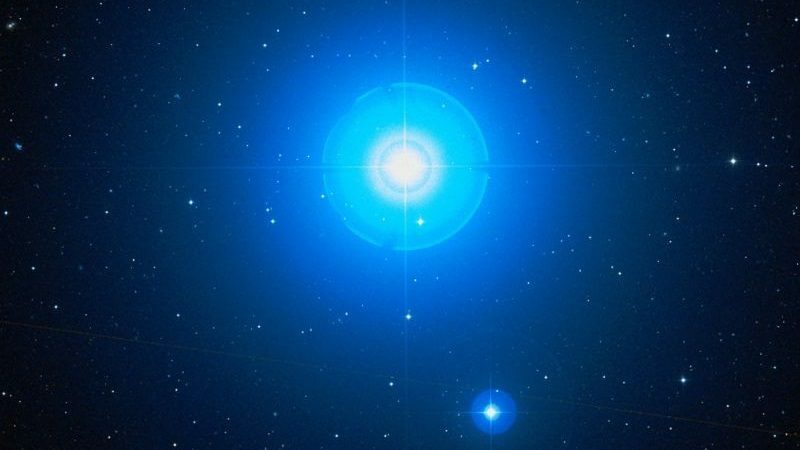 I once read the ancients believed this star could transfer negative karma from son to father, and I believe it happened to my husband born 8/28/1956. He has an estranged son with very difficult chart, born 4/14/80 with Saturn on Denebola. My husband nearly died and had surgery 3/12/2017 on the Full Moon with Denebola highly prominent. The surgeon removed a part of the sternum. The conditions my husband experienced are quite in agreement with the star’s reputation. My husband is a good hearted soul who would do anything for his kids, loved to cook family dinners, etc. but is unfairly called an “a**hole” by that family and has suffered much abuse. Also quite ironically, being informed of his father’s dire condition, the response was “I’m not involved in that anymore”. His father nearly died of a freak infection, lost sternum bone and clavicle bone to be precise, on the Denebola star in the son’s chart. The ancients knew something about transfer of bad karma from son to father. Interesting to start learning about fixed stars, can’t wait to learn more… However as often in astrology I find it disturbing to read info that has a malefic effect of fixed stars. E.g. Debebola is within 2° from my Moon (12H in the birth chart, I live on another continent tho). And within 2° the other way from my mom’s Mars. As someone who is into remedies rather than to scare people with fatal predifined things I wonder what remedies are for various fixed star influences? Jamie, also what orb is usually taken for conjunctions and and other aspects to fixed stars?